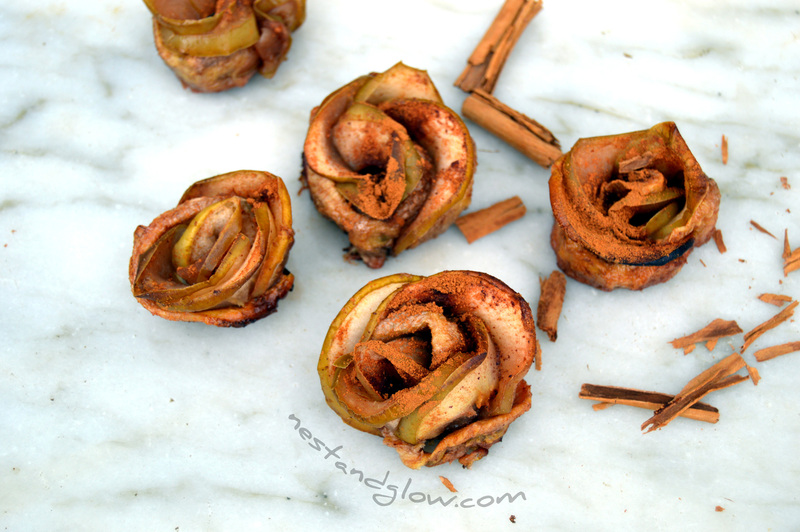 These apple roses are fun and easy to make. They are made of just fruit and a sprinkle of cinnamon. No flour or gluten is needed as the bananas act as the glue for these so they are suitable for gluten-free, vegan, paleo and grain free diets. They take about two hours fifteen in total to make, but most of that the oven is doing the work while you sit back. 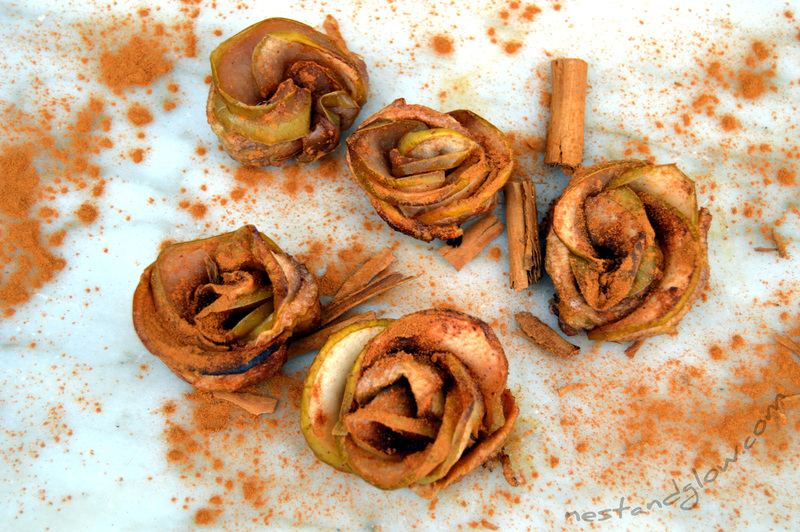 I’ve been wanting to make apple roses for a while now, but all the recipes I’ve seen involve using shop bought pastry. So instead I created something that is dairy, flour / gluten and grain free. They are similar to the banana cinnamon buns but with slices of apple. These apple roses would look more rose like with a red apple, but I only have green growing in my garden. I can’t bring myself to buy apples just for aesthetics when I have an abundant amount falling off a tree in the garden. You can use a dehydrator to make a raw food version, and the apple becomes lovely and crisp, but this does take close to 16 hours to do. Instead of simmering the apples leave them in the current / date juice and add some lemon juice and soak in a warm place for a few hours to soften. Then place in the dehydrator for two 8 hour sessions instead of using the oven. Peal and slice the bananas lengthways into 3. Place on a non-stick sheet in the oven for an hour at 230 F / 110 C.
Core all the apples and slice in half. Thinly slice all the apples lengthwise (verticlally with the stem at the top). Blend the dates, raisins and water. Simmer the sliced apples in the blended fruit water for 5 mins until they soften. Take the bananas out of the oven and with each slice place on 4-5 apple slices with the flat side at the bottom of the banana. See the video for a demo. Sprinkle on cinnamon then roll up the bananas to make the rose and use a cocktail stick or two to hold in place. 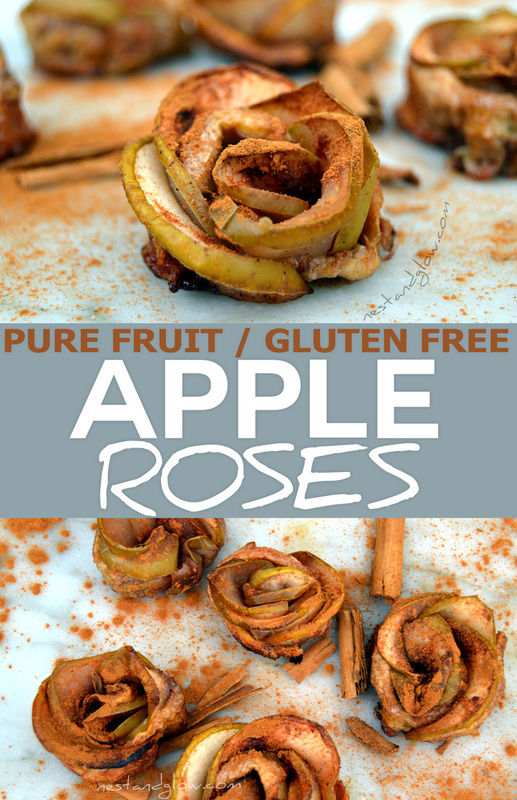 Place the roses back on a non-stick sheet in the oven for an hour at 230 F / 110 C.
These pure fruit roses make a great edible decoration and healthy snack. Well, even though I used red apples, mine did not turn out nearly as pretty as yours lol But they taste very good; thank you for the recipe! Thanks so much for sharing, glad it worked. I used cooking apples in mine, maybe that made a bit of a difference as they are a bit firmer? I’m certainly not a pretty cook!